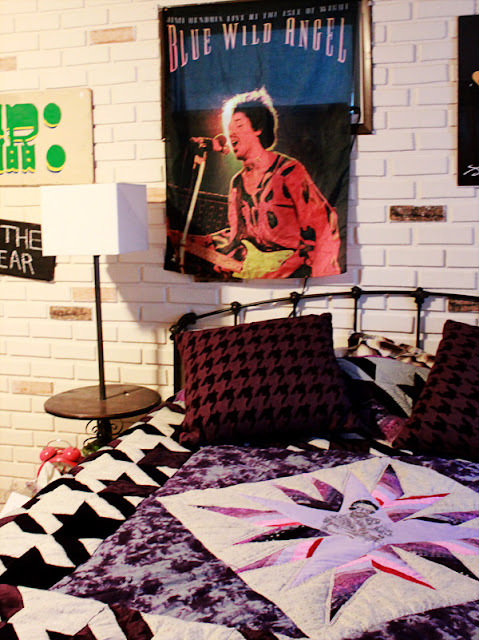 This is a Jimi Hendrix king sized MONSTER that I made for my gypsy prince. This quilt, oh where do I start? It's made with blood, sweat and tears. Literally! Blood: I HAD to hand quilt this one. And despite trying about every other option under the sun, it was just too da*m heavy for a quilt rack (which i completely destroyed trying) or my machine (which has scars to show for it). Soooo....in a hoop it went. Yes the entire thing. Ughhhhh. I was a human pincushion I tell ya, or as an IG commenter put "human voodoo doll" lol. 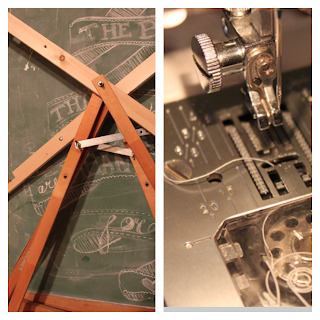 Sweat: I had the "brilliant" idea to go old school and put a old quilt inside and batting. I had visions of time past when this was common practice and fabric stores did not exist. However, I didn't anticipate the shear weight of this bad Larry! Not to mention how hot it was spending countless hours under it stitching it together. Tears: In the months long process of putting Mr. Jimi together I lost two dearly loved family members. He even made a trek to the west coast with the railroader and I to attend one of the funerals. 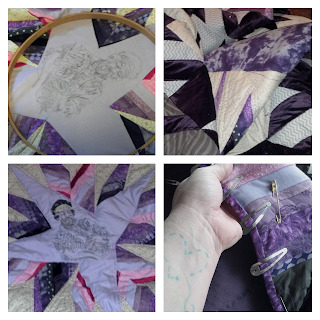 I spent hours in the car reflecting, crying, and stitching. Gives a whole new meaning to mend and make do. As I truly believe that each stitch helped me get through a very dark time. * Although I can only imagine how comical it must of looked to the other motorists passing as I tried to manuver the gigantic mass and ginormous hoop around in the tiny front seat of our car. 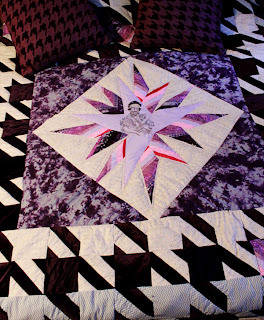 For the center block I used the seriously talented quilting goddess AnnaMariaHorners free Love Emblem pattern . I found a Jimi sketch via Google and used my homemade light box (definetly think I have to post a how-to later, the railroader is a DIY genius I tell ya) to trace into the center. For the houndstooth pattern I went here: http://findingsweetland.blogspot.com/2012/02/houndstooth-quilt-tutorial.html. A truly beautiful blog and very generous free pattern/tutorial! And stitch, stitch, stitch, and you guessed it stitched some more. As for the fabrics used- all from my stash of collected hoarded pieces from various different places. Most of which I couldn't even begin to guess. I do know the purple velvet was a 6 yard score from Goodwill! Oh, and those EPIC pillows that just happen to match perfectly? A Target on-line sale score!! Thank You! Totally made me tear up that you left me a comment. Im such a dork, but your my Hero so it totally made my whole day!